It has been pretty exciting to see so many great blogs posting each day in the #29in29 challenge. The best part for me is that because there were no rules other than to just post something, the topics and photos have been as diverse as the people who pen the blog. Great stuff. Seeing that dirt road trailing away to points out of sight just makes me wish I was there to find out what was on the other side of the hill. There is something so dreamy about the winter light in Sonja’s photo. 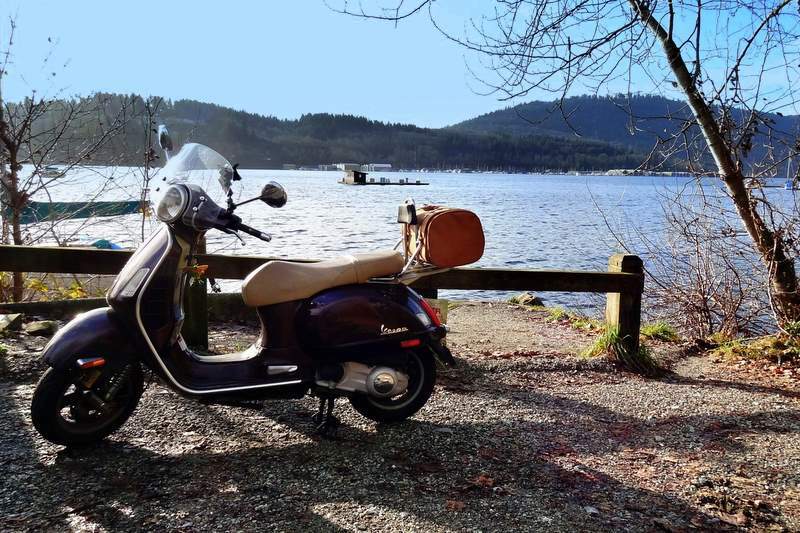 Her handsome Vespa almost looks like it’s smiling for the camera. As you might imagine I’m a sucker for a handsome orange Tiger. Troubadour’s doesn’t disappoint. Yea, maybe it isn’t about motorcycles but I can’t resist a Momma & her little tyke. It must have been amazing to see those Orcas up close. This week I read a post that really touched me but not because of something photographic. It was more than that. When someone lays their soul open for you to come inside and take a look around – that’s heavy deep. If you haven’t already, give Highway Lass’ “There is no safety net” post a read on Transport of Delight. For some people, traveling is so much more than just physically moving from one place to the next. They’re on a whole other kind of journey. Make sure to stop by the following blogs to see how they’re doing throughout the month! Thanks for posting the link to Highway Lass’ post. I agree, it was very thought provoking. In riding as in life, we have no safety net. Fuzzy thanks for coming up with te challenge! It’s great fun reading other’s posts. You rock sista! Oh dear, it wasn’t supposed to be heavy! But thank you for your amazing words and for your comment on the original post. As Dar says, thank you for the inspiration, it has been such a long time since I’ve written every day and I am really enjoying the commitment. I hope people don’t get sick of Australia by the time I’m finished! Maybe “heavy” was a bad choice? I didn’t mean it was a downer, more like.. deep. I love seeing everyone’s post each day. That safety net post was really thought provoking thanks for sharing it on here. I am honored to make the Top 5, thank you. You made some great choices and I’m looking forward to next week’s Top 5. Thanks for the link to the Highway Lass post. Scary stuff on several levels. I’ve been bad. Have been posting everyday but never thought to use the #29in29 in the titles. But I”ll keep posting everyday just to see what happens. So far one shoe has worn out.